Previous study has demonstrated that superoxide and the related products are involved in mediating the effect of low K intake on renal K secretion and ROMK channel activity in the cortical collecting duct (CCD). This study investigated the role of gp91phox-containing NADPH oxidase (NOXII) in mediating the effect of low K intake on renal K excretion and ROMK channel activity in gp91(−/−) mice. K depletion increased superoxide levels, phosphorylation of c-Jun, expression of c-Src, and tyrosine phosphorylation of ROMK in renal cortex and outer medulla in wild-type (WT) mice. In contrast, tempol treatment in WT mice abolished whereas deletion of gp91 significantly attenuated the effect of low K intake on superoxide production, c-Jun phosphorylation, c-Src expression, and tyrosine phosphorylation of ROMK. Patch-clamp experiments demonstrated that low K intake decreased mean product of channel number (N) and open probability (P) (NPo) of ROMK channels from 1.1 to 0.4 in the CCD. However, the effect of low K intake on ROMK channel activity was significantly attenuated in the CCD from gp91(−/−) mice and completely abolished by tempol treatment. Immunocytochemical staining also was used to examine the ROMK distribution in WT, gp91(−/−), and WT mice with tempol treatment in response to K restriction. K restriction decreased apical staining of ROMK in WT mice. In contrast, a sharp apical ROMK staining was observed in the tempol-treated WT or gp91(−/−) mice. Metabolic cage study further showed that urinary K loss is significantly higher in gp91(−/−) mice than in WT mice. It is concluded that superoxide anions play a key role in suppressing K secretion during K restriction and that NOXII is involved in mediating the effect of low K intake on renal K secretion and ROMK channel activity. The superoxide anions are generated by the univalent reduction of triple-state molecular oxygen mediated by NADPH and xanthine oxidase.5 However, it is generally believed that superoxide anions that are generated by NADPH oxidase are a major source of reactive oxygen species in different types of cells.9,10 A large body of evidence indicates that gp91phox-containing NADPH oxidase (NOXII) and NOXIV are expressed in the kidney and that NOXII is expressed in the connecting tubule (CT) and CCD.11,12 It is possible that NOXII could be activated by low K intake and partially responsible for increased production of superoxide anions that is induced by K restriction. Thus, inactivation of NOXII should decrease the superoxide production and impair the renal ability to preserve K during K restriction. In this study, we used gp91phox null mice to test the hypothesis that superoxide anions that are generated by NOXII are involved in mediating the inhibitory effect of low K intake on renal K secretion. We previously demonstrated that K restriction increased superoxide production and that the low K intake–induced increases in superoxide were abolished by tempol treatment in the rat kidney.4 In this study, we first examined the effect of K restriction on superoxide production in wild-type (WT) mice to determine whether the response of mouse kidney to low K intake was the same as that of rat kidney. Data summarized in Figure 1 demonstrate that low K intake significantly increased superoxide production in renal cortex and outer medulla by 100 ± 10% (n = 5; P < 0.01) in comparison with those on a normal-K diet. Also, tempol treatment significantly reduced production of superoxide mediated by low K intake by 90 ± 7% (n = 5) but had no significant effect on superoxide production in mice that were fed a normal-K diet. Thus, the response of mouse kidney to low K intake was the same as that observed in rats. In contrast, the effect of low K intake on superoxide production was significantly attenuated in kidneys from gp91phox (−/−) mice because a decrease in dietary K content increased superoxide formation only by 46 ± 5% (n = 5; P < 0.05). We could not measure the superoxide production in tempol-treated gp91phox (−/−) mice that were on a K-deficient (KD) diet because they were dead within 5 d after tempol injection plus low K diet (n = 8 mice). This indicates that NOXII is an important source for generating superoxide induced by K restriction. Superoxide levels in the renal cortex and outer medulla from wild-type (WT) mice on a normal-K diet (1.1%), normal K + tempol treatment, K-deficient (KD) diet, and KD plus tempol treatment (left set of bars) and in gp91phox (−/−) mice on a control and/or KD diet (right set of bars). #The superoxide level in WT mice that were on a KD diet is significantly higher than that in every other group (P < 0.05). *Significant difference between control [gp91phox (−/−) mice on 1.1% K] and experimental group [gp91phox (−/−) mice on KD diet; P < 0.05]. Superoxide anions and related products have been demonstrated to mediate the effect of low K intake on Src family PTK via stimulation of transcription and translation.4 Thus, diminished superoxide levels are expected to decrease the expression of Src family PTK. We examined the effect of low K intake on c-Jun phosphorylation, an index for activation of the transcription factor. As observed in rats, low K intake significantly increased phosphorylation of c-Jun on serine 73 by 110 ± 5% in WT mice (n = 3; P < 0.05; Figure 2). Tempol treatment abolished the effect of low K intake on c-Jun phosphorylation and had no significant effect on c-Jun phosphorylation in mice that were on a normal-K diet. However, low K intake did not significantly increase the phosphorylation of c-Jun in gp91phox (−/−) mice (15 ± 4%; n = 4). We next examined the effect of low K intake on expression of c-Src, which serves as a representative member of Src family PTK in WT and gp91phox (−/−) mice. Figure 3 is a Western blot showing that low K intake increased the expression of c-Src in WT mice by 115 ± 17% (n = 5; P < 0.01) in comparison with those that were on control K diet. Similar to that in rats, tempol treatment abolished the stimulatory effect of low K intake on c-Src expression (n = 5) and had no significant effect on c-Src expression in mice that were on a normal-K diet. Also, the effect of low K intake on c-Src expression was significantly smaller in gp91phox (−/−) mice than in WT mice because K restriction increased the c-Src expression only by 55 ± 6% (n = 5; P < 0.05). (A) A Western blot demonstrating the effect of low K intake on cJun phosphorylation (top) and total c-Jun (bottom) in the renal cortex and outer medulla of WT mice on a normal-K diet, KD diet, and KD diet plus tempol treatment and gp91phox (−/−) mice that were fed a normal-K and/or a KD diet. (B) A Western blot showing the cJun phosphorylation in renal cortex and outer medulla in tempol-treated and non–tempol-treated WT mice that were fed a normal-K diet. 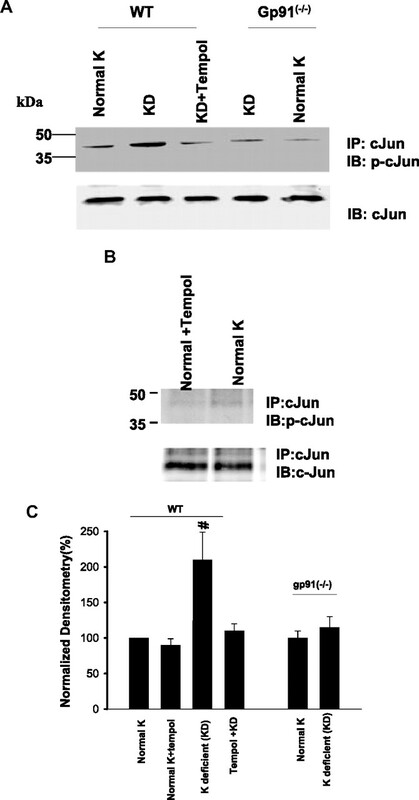 (C) Bar graphs summarize the effect of K intake on cJun phosphorylation under different experimental conditions. #Phosphorylation of cJun in wt mice on KD diet is significantly higher than that in every other group (P < 0.05). (A) A Western blot demonstrating the effect of low K intake on c-Src expression in the renal cortex and outer medulla of WT mice on a normal-K diet, KD diet, and KD diet plus tempol treatment and gp91phox (−/−) mice that were fed a normal-K and/or KD diet. (B) A Western blot showing the c-Src expression in renal cortex and outer medulla in WT mice on normal-K diet with or without tempol treatment. (C) Bar graph demonstrating the effect of dietary K intake on c-Src expression under different experimental conditions. #cSrc level in WT mice on KD diet is significantly higher than that in every other group (P < 0.05). *Significant difference between control [gp91phox (−/−] mice on 1.1% K) and experimental group [gp91phox (−/−) mice on KD diet; P < 0.05]. After demonstrating that deletion of NOXII diminished the effect of low K intake on c-Src expression, we examined the effect of low K intake on tyrosine phosphorylation of ROMK. Similar to rat kidney,8,13 low K intake stimulates tyrosine phosphorylation of ROMK in mouse kidney. Figure 4 is a Western blot showing that K depletion increased the tyrosine phosphorylation of ROMK by 180 ± 10% (n = 6; P < 0.01) in WT mice. The low K intake–induced increase in tyrosine phosphorylation was almost completely abolished by tempol. Also, tempol treatment did not significantly affect the phosphorylation of ROMK in mice that were on a normal-K diet. Thus, superoxide anions play a key role in mediating the effect of K restriction on tyrosine phosphorylation of ROMK in mouse kidney. This view is also supported by the observation that the K restriction–induced stimulation of tyrosine phosphorylation was significantly attenuated in gp91phox (−/−) mice. Low K intake increased the tyrosine phosphorylation of ROMK only by 75 ± 6% (n = 6; P < 0.05) in comparison with gp91phox (−/−) mice that were fed a normal-K diet. (A) Western blot showing the effect of low K intake on tyrosine phosphorylation of ROMK (top) and total ROMK expression (bottom) in the renal cortex and outer medulla in WT mice on a normal-K diet, KD diet, and KD diet plus tempol treatment and gp91phox (−/−) mice that were fed a normal-K and/or KD diet. (B) Western blot showing the tyrosine phosphorylation of ROMK in renal cortex and outer medulla in WT mice on normal-K diet with or without tempol treatment. (C) Bar graph showing the effect of K restriction on the tyrosine phosphorylation of ROMK. #Tyrosine phosphorylation of ROMK in WT mice on KD diet is significantly higher than that in every other group (P < 0.05). *Significant difference between control [gp91phox (−/−) mice on 1.1% K] and experimental group [gp91phox (−/−) mice on KD diet; P < 0.05]. Because increased tyrosine phosphorylation of ROMK has been shown to enhance the internalization of the K channels,8 inhibition of tyrosine phosphorylation of ROMK was expected to diminish the low K intake–induced internalization of ROMK in tempol-treated WT or in gp91phox (−/−) mice. We examined the ROMK staining in the kidney of mice that were kept on a normal-K or KD diet (Figure 5). A sharp apical/subapical staining of ROMK was observed in the kidney of WT mice (Figure 5, A through C) and gp91phox (−/−) mice (Figure 5D) that were fed a normal-K diet. The intensity of apical/subapical staining of ROMK was apparently diminished in both outer medulla (Figure 5A) and cortex (Figure 5B) of WT mice that were kept on a KD diet for 7 d. In contrast, a relative sharp apical/subapical staining of ROMK was still observed in tempol-treated mice that were on a KD diet for 7 d and also in gp91phox (−/−) mice that were fed a KD diet (Figure 5D). For this set of experiments, we used three mice for each group and repeated the staining for each mouse at least twice. We observed a similar staining pattern in every experiment (at least three sections per mouse, and three mice were used). Also, we conducted experiments in rats and found that tempol treatment increased the apical/subapical ROMK staining in rats that were fed a KD diet in comparison with those without tempol treatment (W.-H.W., unpublished observations). Confocal images demonstrate the effect of dietary K intake on ROMK staining in wt mice (A through C) and gp91phox (−/−) mice (D). 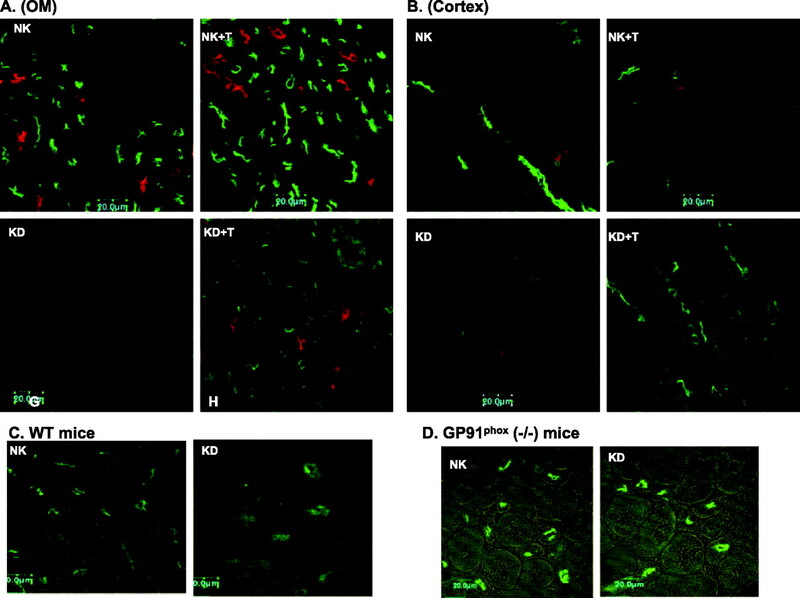 Double staining of aquaporin 2 (red) and ROMK (green) in outer medulla (A) or cortex (B) of tempol (T)-treated or non–tempol-treated mice on normal-K (NK, 1.1%) and KD diets, respectively. (C) ROMK staining in outer medulla of WT mice on NK or KD diet. (D) ROMK staining in outer medulla of gp91phox (−/−) mice on NK or KD diet. We used the patch-clamp technique to examine the ROMK-like SK channels in the CCD of WT mice on a control K diet, a KD diet, and a KD diet plus tempol. Data summarized in Figure 6 show that K restriction decreased product of channel number (N) and open probability (P) (NPo) by 64% from 1.1 ± 0.3 to 0.4 ± 0.1 (n = 10; P < 0.05) in the CCD of WT mice. Tempol treatment significantly increased channel activity (NPo = 0.9 ± 0.2; n = 10) in the CCD of mice that were on a KD diet. The channel activity in the CCD of gp91phox (−/−) mice that were on normal-K diet was not significantly different from that of WT mice (NPo = 1.1 ± 0.3; n = 10). However, K depletion modestly decreased NPo by 37% to 0.7 ± 0.2 (n = 6; P < 0.05). Therefore, low K intake–induced suppression of SK channels in the CCD was compromised in gp91phox (−/−) mice. The SK channel activity in the cortical collecting duct of WT mice on a normal-K diet, normal-K diet with tempol treatment, KD diet, and KD diet plus tempol treatment (left set of bars) and gp91phox (−/−) mice that were fed a normal-K and/or KD diet (right set of bars). The experiments were performed in cell-attached patches. Significance between different groups is indicated. Because ROMK-like SK channels are responsible for K secretion, changes in the channel activity should influence renal K excretion. Therefore, we used the metabolic cage to study renal K excretion in mice that were on control K diet, on a KD diet, or on a KD diet plus tempol for 7 d. The mean food intake (per mouse per day) was 3.2 g for gp91phox (−/−) mice that were on a normal-K diet, 3.04 g for gp91phox (−/−) mice that were on a KD diet, 2.6 g for WT mice that were on a normal-K diet, 3.5 g for WT mice that were on a KD diet, and 3.4 g for tempol-treated mice that were on a KD diet. Results summarized in Figure 7, A and B, show renal K excretion of mice that were on normal-K and KD diets, respectively. Low K intake decreased 24-h renal excretion from 0.48 ± 0.08 to 0.02 ± 0.01 mEq in WT mice (n = 4; P < 0.001). However, renal K excretion in tempol-treated mice that were on a KD diet was significantly higher (0.10 ± 0.02 mEq; n = 4; P < 0.01) in comparison with that without tempol treatment. 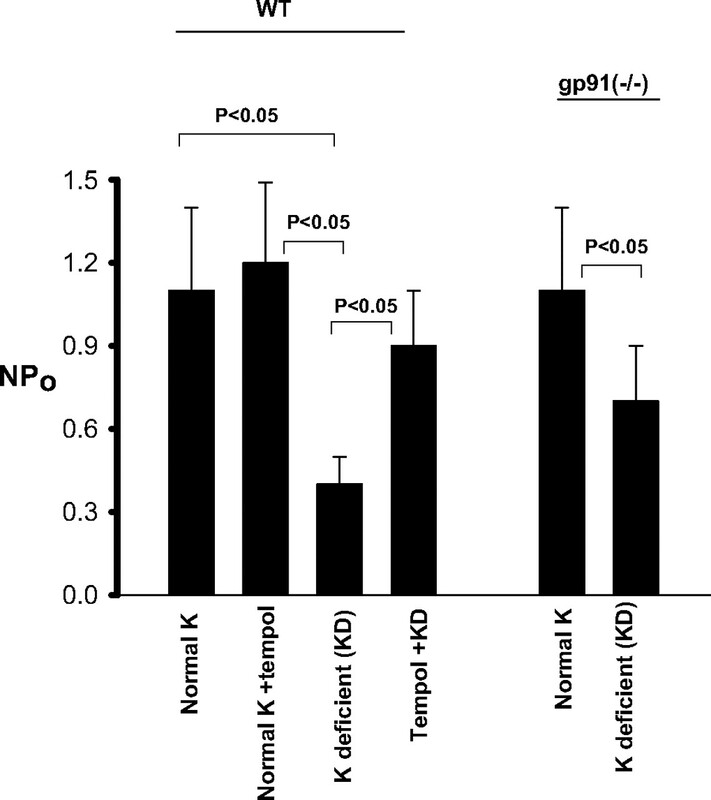 Although renal K excretion in gp91phox (−/−) mice that were on a normal-K diet (0.51 ± 0.04 mEq) was not significantly different from that of WT mice, K depletion caused less inhibition of renal K excretion (0.05 ± 0.01 mEq) in gp91phox (−/−) mice (Figure 7B). We also measured plasma K concentration in WT and gp91phox (−/−) mice (Figure 7C). Low K intake decreased plasma K concentration by 30% from 3.9 ± 0.4 (control K diet) to 2.7 ± 0.1 mM and had further fallen to 2.3 ± 0.1 mM in tempol-treated mice that were on a KD diet (Figure 7C). In gp91phox (−/−) mice, K restriction decreased plasma K concentration by approximately 40% from 4.2 ± 0.3 (control K diet) to 2.6 ± 0.01 mM (Figure 7D). Falls in plasma K concentrations were slightly higher in gp91phox (−/−) mice than in WT mice. (A) Twenty-four-hour urinary K excretion in WT mice on normal-K diet (1.1%), WT mice on KD diet, tempol-treated WT mice on KD diet, gp91phox (−/−) mice on KD diet, and gp91phox (−/−) mice on normal-K diet. 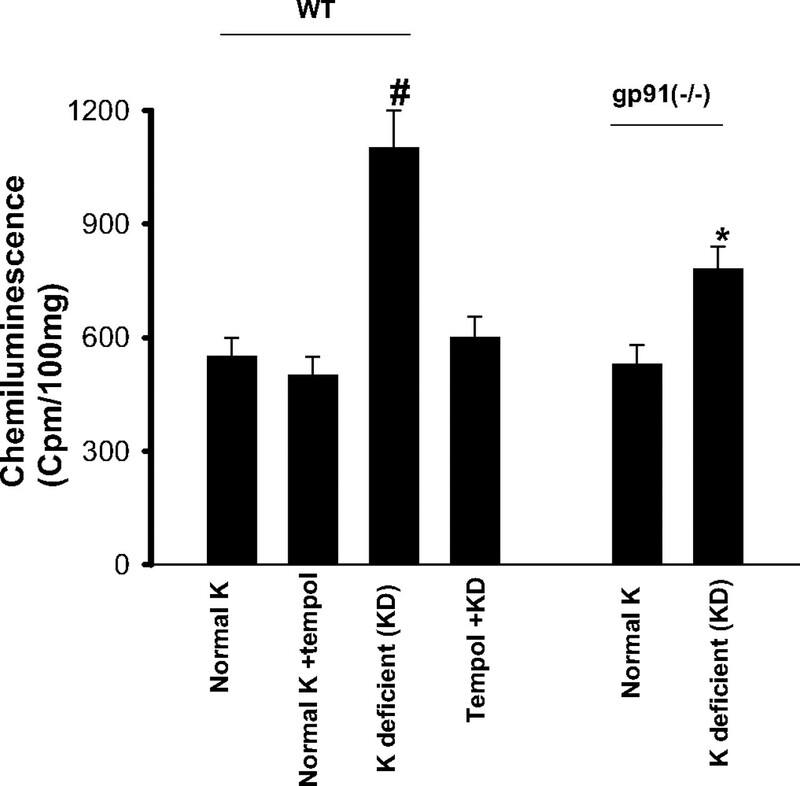 (B) Plasma K concentrations in WT mice on a normal-K diet, KD diet, or KD diet plus tempol for 7 d (left set of bars) and in gp91phox (−/−) mice on a normal-K or KD diet (right set of bars). *Significant difference from the corresponding control (normal K) and experimental groups. A large body of evidence has indicated that superoxide anions and the related products not only are involved in the regulation of immunoresponse but also play an important role in mediating a variety of cell functions.5 Superoxide anions have been demonstrated to modulate the activity of various protein kinases and phosphatases.14–19 Hydrogen peroxide has been shown to inhibit protein tyrosine phosphatase17,20,21 and activate several members of Src family PTK, such as Lck and Fyn.18,19 Stimulation of insulin receptors has been shown to augment the formation of superoxide,22 and low concentrations of hydrogen peroxide can potentiate the insulin effect in insulin-responsive tissues.23 Furthermore, high concentrations of hydrogen peroxide can induce insulin-like effects via stimulation of the tyrosine phosphorylation of the insulin receptor.24 This study has added another piece of evidence demonstrating the role of superoxide anions in the regulation of renal K excretion. Renal K excretion is determined by both K secretion in the CT and the CCD and K absorption in the outer medullary collecting duct.3,25 For K secretion, K enters the cell across the basolateral membrane via Na-K-ATPase and is secreted into the lumen through apical K channels. It is generally accepted that ROMK channels are mainly responsible for K secretion under normal K intake. We and others have shown that the K restriction decreased ROMK channel activity and caused the internalization of ROMK channels.13,26,27 Although the molecular mechanism by which low K suppresses ROMK channel activity and renal K secretion is not completely understood, our previous study suggests that superoxide anions and related products are signaling molecules that mediate the effect of low K intake on ROMK channels and renal K secretion4,7,28 Furthermore, we show that P38 and ERK MAPK and PTK are involved in mediating the effect of superoxide anions on ROMK channels.4,7,28 The role of P38 and ERK MAPK in mediating the effect of low K intake and superoxide anions on ROMK channels is supported by several lines of evidence: (1) Application of hydrogen peroxide stimulated the phosphorylation of ERK and P38 MAPK in M-1 cells; (2) inhibition of superoxide anion production with tempol abolished the stimulatory effect of low K intake on the phosphorylation of P38 and ERK; and (3) suppression of P38 and ERK MAPK increased ROMK channel activity and diminished the inhibition of ROMK channels induced by hydrogen peroxide in the CCD.28 The evidence to support the role of PTK in mediating the effect of low K intake and superoxide anions on ROMK channel activity26 includes the following: (1) Low K intake significantly increased the expression of Src family PTK and suppression of superoxide anions abolished the effect of low K intake on PTK expression,4 (2) increased PTK activity enhanced the tyrosine phosphorylation of ROMK channels29 and enhanced the internalization of ROMK channels,8 and (3) inhibition of PTK attenuated the hydrogen peroxide–induced inhibition of ROMK channels in the CCD.28 Because low K–induced increases in PTK expression occurs later than that of the phosphorylation of P38 and ERK MAPK, it is possible that the inhibitory effect of low K intake on ROMK channels and renal K secretion is first achieved by activation of MAPK.7 However, it is safe to conclude that superoxide anions mediate the effect of low K intake on ROMK channels and renal K secretion through MAPK and PTK. Another important finding of this study is that NOXII participates in generating superoxide anions that are induced by low K intake. Although NOXII is the most abundant in macrophages among other types of cells, several studies demonstrated that NADPH oxidase was also expressed in the kidney.11,12 It has been reported that mRNA for all five components of the phagocyte-type NADPH oxidase in the rat kidney and that immunocytochemical studies have further confirmed the expression of p22phox, p47phox, and p67phox in the luminal membranes of macula densa, distal convoluted tubule, and the CCD. However, two lines of evidence indicate that oxidase other than NOXII is also involved in mediating the effect of low K intake on renal K secretion and ROMK channel activity: (1) The tempol treatment–induced K loss was more severe in WT mice that were on a KD diet than in gp91 (−/−) mice that were on a KD diet; and (2) low K intake still increased superoxide levels in gp91(−/−) mice, whereas tempol treatment completely abolished the effect of K restriction on superoxide production. It is known that superoxide anions are also generated through activation of cytochrome P450 oxidase, cyclooxygenase, and xanthine oxidase,30 which are expressed in the renal tissue. Moreover, a renal type of NOXII homolog, NOXIV, has been shown to be expressed in the renal tubules.12 We need further experiments to examine the role of other oxidases such as NOXIV in mediating the effect of low K intake on renal K secretion and ROMK channel activity. Although this study is mainly focused on the role of superoxide anions in the regulation of ROMK channels, the finding that BK channels are inhibited by P38 and ERK MAPK, which are activated by superoxide anions, suggests that superoxide anions could also inhibit BK channels.36 Several studies have convincingly demonstrated that BK channels are also involved in K secretion during high K intake and high tubule flow rate.37–39 In addition, BK channels are present also in intercalated cells (IC) and could play a role in K recycling across the apical membrane of IC. Because K recycling determines the efficiency of K absorption via K-H-ATPase,40 superoxide anion may also be involved in the regulation of K absorption in the outer medullary collecting duct. Superoxide anions and related products play a role in mediating the effect of low K intake on renal K secretion through a MAPK- and a PTK-dependent pathway, and NOXII is an important source of superoxide generated during K restriction. Male gp91phox (−/−) and C57BL/6 (WT) mice (6 wk old) were purchased from Jackson Laboratory (Bar Harbor, ME). C57BL/6 have the same genotype, and they were age-matched with gp91phox (−/−). Three days after they were received, the mice were housed in metabolic cages (two mice per cage) for 3-d adaptation. Mice (WT) were divided into three groups: (1) Control group in which animals were kept on a normal-K (1.1%) diet and had a daily intraperitoneal injection of saline for 1 wk, (2) low K intake group in which mice were maintained on a KD diet and received a daily intraperitoneal injection of saline for 7 d, and (3) the tempol-treated group in which mice were also fed a KD diet and had a daily intraperitoneal injection of tempol (15 mg/kg) for 1 wk. The gp91phox (−/−) mice were divided into two groups: Control and low K intake. Data regarding 24-h food intake, body weight, and urine output were recorded. After metabolic cage study, the mice were anesthetized with pentobarbital (60 mg/kg), blood was drawn from the heart, and the kidneys were removed for tissue preparation. Plasma and urinary K and Na concentrations were measured using flame photometry, and daily Na and K excretion was expressed as mEq/24 h.
We followed the method described previously for measurement of superoxide.41 The tissue from mouse cortex and outer medulla (100 mg) was cut into a small piece with a sharp blade and suspended in air-equilibrated MOPS-sucrose buffer (pH 7.4) that contained 5 μΜ lucigenin. Although lucigen has been shown to alter superoxide level in cells, the concentration of lucigen that was used in this study (5 μΜ) has been shown to have no significant effect on cell superoxide production.42 The chemiluminescence that was elicited in the presence of lucigenin was measured in a liquid scintillation counter with a single active photomultiplier tube positioned in out-of-coincidence mode. Blanks were subtracted from the average level of the chemiluminescence signal. The corresponding antibody was added to the protein samples (500 μg) that were harvested from kidneys at a ratio of 5 μl/ml (1:1000) of solution, and IgG antibody was used as negative control for immunoprecipitation experiment. The mixture was gently rotated at 4°C overnight, followed by incubation with 25 μl of protein A/G agarose (Santa Cruz Biotechnology, Santa Cruz, CA) for an additional 2 h at 4°C. The tube that contained the mixture was centrifuged at 3000 rpm and washed twice with PBS that contained 10 μl/ml PMSF and 10 μl/ml protease inhibitor cocktail. The agarose pellet was resuspended in 25 μl of 2× SDS sample buffer that containing 4% SDS, 100 mM Tris-HCl (pH 6.8), 20% glycerol, 200 mM dithiothreitol, and 0.2% bromophenol blue. After the samples were boiled for 5 min, the proteins were separated by electrophoresis on 10% SDS-polyacrylamide gels and transferred to Immuno-Blot polyvinylidene membrane (Bio-Rad, Hercules, CA). The membrane was blocked with 5% nonfat dry milk in Tris-buffered saline and incubated overnight with the primary antibody at 4°C, then washed three times for 15 min with Tris-buffered saline that contained 0.05% Tween 20, followed by incubation for 30 min with respective second antibody horseradish peroxidase conjugate. ECL plus (Amersham Pharmacia Biotech, Piscataway, NJ) was used to detect the protein bands, and the intensity of the bands of interest was determined using Alpha DigiDoc 1000 (Alpha Innotech, San Leandro, CA). Kidneys were perfused in situ with PBS plus heparin (40 U/ml) and fixed with 4% paraformaldehyde. Five-micrometer slices were cut from paraffin-embedded tissue. After performing heat-induced antigen retrieval, the tissue samples were blocked with 2% goat serum in 1× PBS for 1 h at room temperature. Then, the slices were incubated overnight with primary antibody (anti-ROMK antibody; Alamone, Jerusalem, Israel) diluted 1:50 in the blocking solution (4°C). The sections were washed in PBS and incubated with the second antibody, 488 goat/rabbit (1:200), in PBS for 2 h. The slides were washed with PBS for 30 min. Kidney slices were placed in the same slide and treated with identical procedure. Images were acquired at the same gain and contrast. Mouse CCD was isolated and placed in a chamber (1000 μl) mounted on an inverted Nikon microscope. The CCD were superfused with HEPES buffered NaCl solution that contained (in mM) 140 NaCl, 5 KCl, 1.8 CaCl2, 1.8 MgCl2, and 5 HEPES (pH 7.4). The pipette solution was composed of (in mM) 140 KCl, 1.8 MgCl2, and 5 HEPES (pH 7.4). The temperature of the chamber was maintained at 37 ± 1°C by circulating warm water around the chamber. The CCD was cut open with a sharpened micropipette to expose the apical membrane. where ti is the fractional open time spent at each of the observed current levels. Antibodies to c-Src and β-actin were purchased from Santa Cruz Biotechnology and anti–tyrosine-phosphorylation antibody (4G10)43 and ROMK antibody were obtained from Upstate USA (Charlottesville, VA) and Alamone, respectively. The specificity of ROMK antibody was tested previously in ROMK null mouse in which immunostaining was completely absent in the kidney.44 Antibodies to phospho-c-Jun (serine 73) and c-Jun were obtained from Cell Signaling Technology (Beverly, MA). The 4-hydroxy-tempo was obtained from Sigma (St. Louis, MO). Data are shown as means ± SEM, and one-way ANOVA statistical analysis was used to determine the significance among the three groups. Statistical significance was taken as P < 0.05. The work is supported by National Institutes of Health grant DK47402 and DK54983. We thank Drs. Pawel Kaminski and Michael Wolin for help in measurement of superoxide in the kidney.